Slow Cooker Pork Carnitas are an incredibly easy recipe that is full of flavor! Sweet and spicy shredded Mexican pork makes the perfect base for tacos. But it is the fresh Mexican Slaw that makes these Pork Carnitas irresistible. Pork Carnitas are a family favorite recipe! Tender, juicy pork is topped with a creamy, fresh slaw for a perfect combination of flavors and textures. When you add in the bonus that these pork tacos are made in the slow cooker with minimal work–well, this family meal just got even better! Traditional Carnitas are made by braising or simmering pork shoulder in oil or lard. These Slow Cooker Pork Carnitas are a bit different and may as well be called Pork Tacos. I use a leaner pork loin instead of a shoulder and do not use any lard or fat. The pork loin is braised via the slow cooker with beer, orange juice, and Mexican spices for a perfect base for tacos. 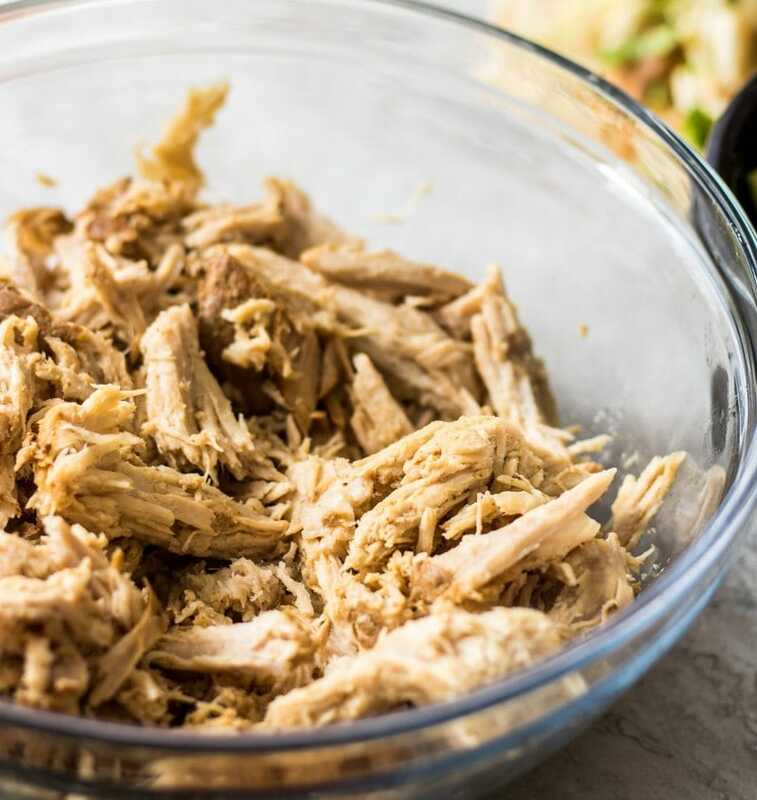 This recipe for pork carnitas is easy, allergy friendly, and makes a TON–perfect for a party! Follow these few simple steps to make Pork Carnitas and let the slow cooker do the rest of the work for you! Heat the oil in a large stock-pot over high heat. Season a pork loin with salt and pepper. Sear the pork loin for 1-2 minutes per side. Place the seared pork pork into a crock pot. Combine the beer (or stock), orange juice, salt, pepper, garlic, cumin, chili and cayenne together and pour over the meat. Set the crock pot to low for 10-12 hours or on high 5-7 hours. Once the meat has cooked, shred the pork with two forks and mix into the juices that were rendered while cooking. Topping a baked sweet potato or baked potato. And I think that the Mexican Slaw is a must!! Stir together sour cream and Greek yogurt with juice of 1 lime, a handful of chopped cilantro, 1 tsp cumin, and salt and pepper. Stir the mixture into shredded cabbage. I like to make the slaw after placing the meat into the crock-pot to give the slaw time to develop flavors. But it can be made last minute. If you need these to be Gluten-Free Carnitas, just omit beer and use chicken stock and serve on corn tortillas. You can even use these homemade corn tortillas from Foolproof Living. I like to use pork loin for a lean, yet flavorful carnita meat, but you can use pork shoulder if you’d prefer. If pork is not your thing, use an equal amount of boneless, skinless chicken breasts or thighs and cut cooking time to 6 hours on high and 3-4 hours on low. 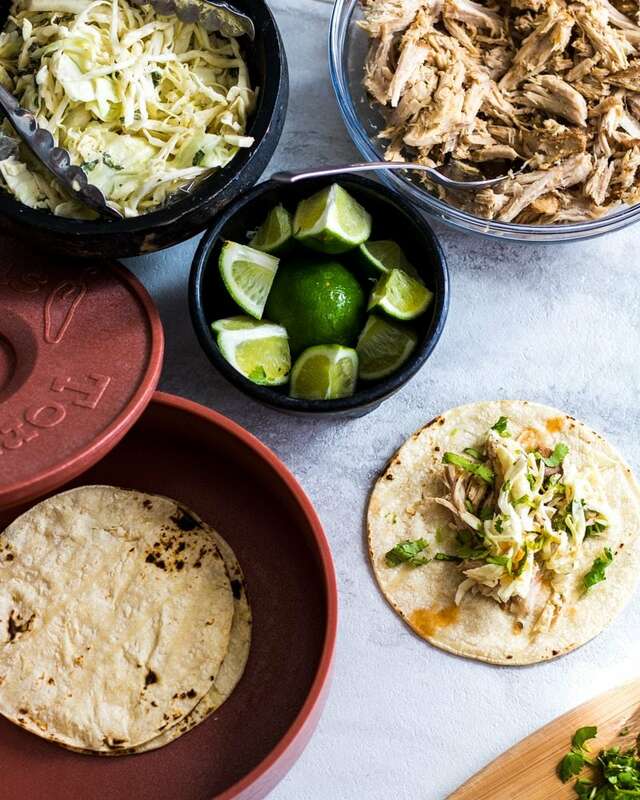 To make Instant Pot Carnitas, see directions here for Instant Pot Pork Tacos. The Mexican Slaw is an easy, tasty way to jazz up these pork tacos, but feel free to top with traditional taco toppings instead. 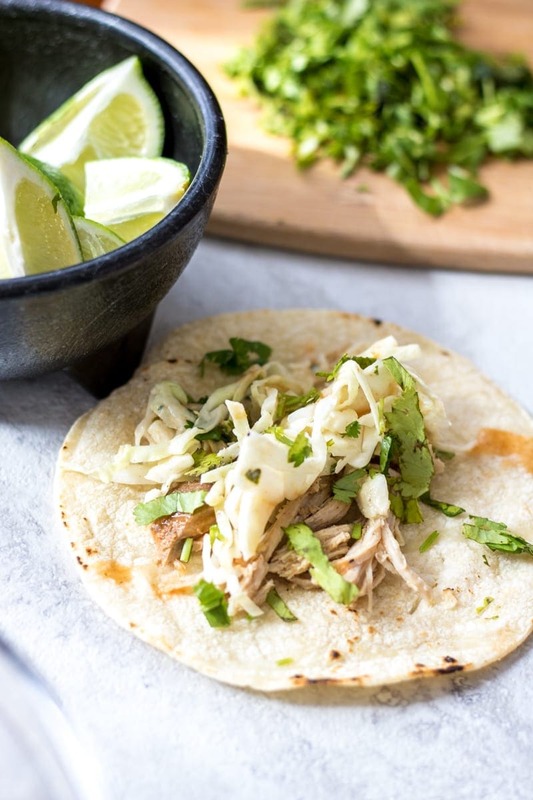 Slow Cooker Pork Tacos jazzed up with a fresh and tangy slaw. Shred the meat with two forks and mix into the juices that were rendered while cooking. Stir in shredded cabbage and refrigerate until ready to serve. Serve the meat topped with the slaw. This is great! I love meals, where the leftovers can be redone to make a completely new meal. Will save me some time in the kitchen. And the crockpot is another plus! Pinned! Thanks so much. I love morphing leftoversinto tummy new creations. We’re big fans of carnitas here in South Texas…yum! Then this recipe is for you! Let me know how you like it. Mexican is my absolute favorite! I just made some slow cooked pork tonight for a panini recipe I want to try…maybe we’ll make pork tacos with the leftovers! I made extra! Michelle…yes you should definitely try the pork tacos. If your meat is already cooked, just flavor with cumin, chili powder and some fresh orange juice or lime juice. And top with the slaw. That takes it over the top. Let me know if you try. This looks so delicious and love the bonus meal. I would love it if you would share this inspirational post at our WIW Linky Party. I hope you can join us! Oh yes, please try and let me know what you think!! I think this is just the recipe you have been waiting for! We love carnitas. I like your Mexican bowl. I want to try this. Sounds yummy. Thanks Bev, I bet you will love the carnitas and the bowl as leftovers. Enjoy. We would just love this awesome Mexican Food Meal, it looks delicious! Thanks for sharing with Full Plate Thursday, I always look forward to your visits! So sweet. Thank you Miz Helen. I hope you make these for your Mexican loving family. They are! I hope you enjoy!! Thanks so much for sharing your delicious recipe at the Say G’day Saturday Linky Party. I’ve just pinned this to the Say G’day board and can’t wait to try it! This sounds absolutely amazing! We don’t ever do much with pork at our house, because I didn’t grow up eating it. I will definitely have to pick up the ingredients for this though because we love mexican here! Thanks for sharing this at the Bloggers Brags Pinterest Party! I’m pinning this to the group boards as well as some of my personal boards. Thanks Rebekah. I am sure this recipe would work with skinless, boneless chicken as well. Try them and let me know how you like them. I cannot wait to try this! My husband will love it. Thank you for linking up at Tickle My Tastebuds last week. I am featuring you this week and would love if you would stop by and link up some more delicious recipes! Awesome!! Thank you so much for the feature and I will be sure to stop by again! Enjoy the Pork–it is delicious! What type of beer would you recommend using? Any lighter flavor beer would work. Corona is great. The last time I made these I used one of my husbands bud lights and it was great. I would just steer clear of a flavored beer or a really dark beer like Guinness. thank you Kristen! making these tonight! Let me know how you like them!!! Can’t wait to hear! Yea!! That makes me so happy! And yes, the leftovers would be amazing in enchiladas. I love “morphing” one meal into another. This is a perfect dish to try on a busy weeknight! I can’t wait to put this into my rotation. Totally! It really helps make dinner so much easier during the weeks. I don’t know which I like better, the sound of the pork or the slaw! HA! That is why you need them both! Those carnitas look delicious! Great idea for a cole slaw too!! I’m pretty sure I’m making this this weekend! Thanks so much Karen. I hope you enjoy them! I love Mexican food but never made tacos before. I think I should soon because my family would love them for sure! Oh, you must try these soon! I think you would love them for sure! I love making pork carnitas in the crock pot, your version with the slaw sounds delicious! Thanks Joy. The slaw does add so much. We eat a lot of pork carnitas because my hubby makes them all the time but it is always a long process. Such a nice treat to have them from the crock pot! Well you are a lucky lady that your husband makes them–but I am NOT in the same boat and don’t have that kind of patience. I never had pork tacos until I moved to Texas. Now I can’t get enough of ’em! Pork tacos are pretty amazing! Pork in the crock pot is the best, it’s so tender and delicious – and I love the recipe you shared at the end too. How perfect for the leftovers. Thanks Joanie. And I agree, pork is always the moistest and most flavorful from the crock-pot. Holy yummers! I pinned this for next week’s dinner menu…tacos and crock pots are two of my favorite things! Awesome. I know you will just love it! Oh this sounds good! I’m psyched because I have a pork loin in the freezer and I can make it this week! Oh yes, you have to make this–you will love it! Love the crock-pot, especially in the hot summer. pork in the slow cooker for tacos sounds perfect to me! Love slow cooker meals that many meal can be made from. Also the slaw sounds perfect, lots of flavor here. Thanks Cheri! I love slow cooker meals as well. I love the fresh slaw on top of this! Sounds amazing! I adore carnitas!! And with slaw??? This is a home run dinner!! I don’t know what I like better the pork carnitas or the slaw! Looks delicious! Thanks Denise, together they are perfect! I love this recipe. I’m sharing the video on my Facebook page. It’s schedule for tomorrow. Carnitas are one of our favorites, though I’ve not made it with beer – might have to give it a try! Caroline, the beer and orange juice create the most tender and flavorful meat out there! The perfect meal, can’t wait to try it! Made the Carnitas tonite and YUMM!! We didn’t have the slaw ingredients, But it was delicious…everybody made their own tacos or salads with usual taco toppings. So good and tender, great flavor! Had to use a oneless pork loin instead of the pork loin roast and the High 5-7 hrs setting, and it was still DE-licious. And plenty leftover meat to send with the college boy for his freezer! Yay! YAY!!!! Gotta love a meal that everyone loves AND gives you leftovers! What kind of orange juice is best to use? Hey Nicole–any 100% OJ works. I like to use pulp free, but that is a personal preference.